Overview: This state-of-the-art preclinical imaging centre provides the latest generation of multi-modality imaging platforms, including a 7 Tesla MR system, a PET/SPECT/CT scanner, µCT and optical imaging all from the same vendor - Bruker, Germany alongside high frequency ultrasound from FujiFilm Visualsonics. 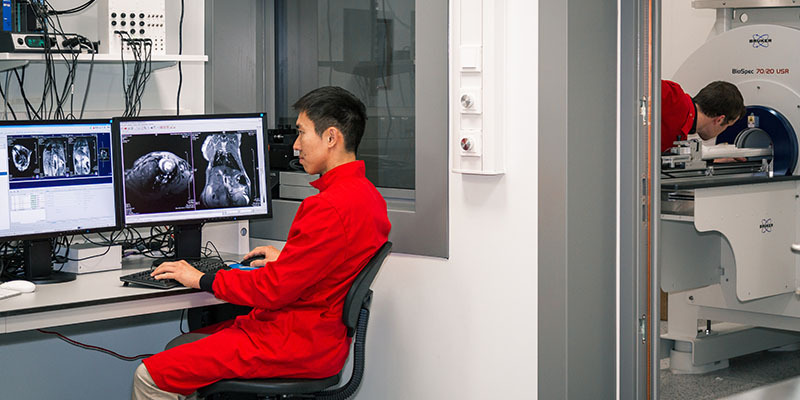 In 2014 the British Heart Foundation awarded £1.9m to support the development of a new centre for translational cardiovascular imaging that links basic science, preclinical and clinical cardiovascular research in Leeds and promotes rapid translation from molecular to clinical cardiovascular research. Additional funding in excess of £4m has been provided by the University of Leeds. The funding allowed us to establish a new purpose-built facility: ePIC. This state-of-the-art preclinical imaging centre is directed by Prof Jurgen E Schneider, and provides the latest generation of multi-modality imaging platforms, including a 7 Tesla MR system, a PET/SPECT/CT scanner, µCT and optical imaging all from the same vendor - Bruker, Germany alongside high frequency ultrasound from FujiFilm Visualsonics. The mission of the centre is to bring about a step change in cardiovascular and biomedical research in Leeds and to offer unique translational research opportunities. Magnetic resonance imaging (MRI) is a versatile technology that provides sensitivity to a wide range of biologically relevant information. A selection of techniques available include, for example, high-resolution anatomical imaging, T1 and T2 mapping for tissue characterisation, diffusion MRI for assessment of cellular microstructure, angiography for measurement of vessel flow, Dixon imaging for fat-water quantification, and magnetic resonance spectroscopy (MRS) for metabolic imaging. ePIC is equipped with a next generation Bruker Biospec 7T preclinical MRI suitable for small animal imaging. The scanner is complemented by a high-end 1.5T/m gradient insert, and a suite of dedicated RF coils for different imaging applications. Positron Emission Tomography (PET) is a functional imaging technique which uses molecular tracers labelled with positron emitting radioisotopes to target a biological process. In this method, emitted radioactivity is detected to form an image from the decay event, which represents the biological pathway to which the molecule is specific to. Most commonly seen in oncology practices, the most widespread tracer used is fluorodeoxyglucose (FDG), which is a glucose molecule labelled with 18F. Like glucose, FDG follows metabolism pathways and accumulates in many forms of cancer due to the proliferative, energy-hungry nature of the disease. PET can also be used to image neurological, cardiovascular and metabolic diseases and is capable of monitoring disease progression and responses to therapy. The PET detection system forms a piece of the Albira Si imaging platform; a single instrument which contains PET, SPECT (Single Photon Emission Tomography) and CT (Computed Tomography) imaging capabilities. While PET imaging focuses purely on tracers labelled with positron emitting isotopes, SPECT imaging can use a wide range gamma emitting isotopes over a broad energy range. Having both PET and SPECT detectors in the same instrument provides versatility in optimising the tracer and imaging method of choice to a particular disease model. The CT component provides anatomical registration of a model to the biological data provided by PET or SPECT. A Hidex ex-vivo automated gamma counter is also available for radioactivity detection in harvested tissues alongside our PET/CT setup. The PET systems comprises of 3 cylindrical detector rings over a 15mm axial field of view, while the SPECT system consists of 2 opposite detectors which rotate around a gantry, capable of zoom functions and interchangeable collimators for providing a range of spatial resolutions. Micro Computed Tomography (µCT) uses X-ray beams to acquire images at multiple angles around an object to create 3-dimensional image. In ePIC, we have in vivo SkyScan 1176 (Bruker, Belgium) scanner, which can acquire images with three different pixel size settings: 35, 18 and 9 µm and allows for scanning both mice and rats. µCT can be used to obtain anatomical information of high density structures such as i.e. bones, heart and vessel microcalcification. However, with use of in vivo or ex vivo contrast agents it is possible to also visualise soft tissues and vasculature. We offer a 2D multi-modal optical imaging platform with a Bruker Xtreme II system. This allows imaging of up to 5 mice or 3 rats simultaneously. The Xtreme II allows five different modalities in a single co-registered system encompassing: Bioluminescence imaging, Multispectral VIS-NIR Fluorescence imaging, Direct Radioisotopic Imaging, Cherenkov Imaging and X-ray imaging. The system can be used with a wide range of optical reporters, radiotracers or X-ray agents (e.g. luciferase, fluorescent proteins, inorganic fluoropores, Cherenkov – 18F or non-Cherenkov – 99Tc isotopes, Barium, Visipaque or Exitron. The Xtreme II is housed in the radioactive imaging suite within ePIC. We offer state-of-the-art ultra high-frequency sonographic ultrasound imaging with a Vevo2100 in-vivo ultrasound system from Visualsonics (Fujifilm). The high-frequency transducers allow in-vivo resolution down to 30 microns. Standard B-mode and M-mode imaging is available alongside pulse-wave Doppler and colour Doppler, ECG-gated Kilohertz Visualisation mode and 3D imaging with cardiac and respiratory gating. This imaging platform is non-invasive, requires no ionising radiation and is ideal for longitudinal studies. The Vevo2100 is currently housed on the clean side of CBS.